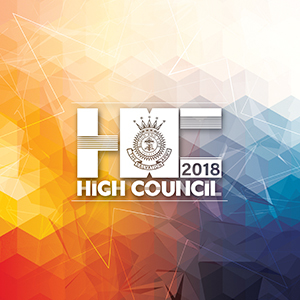 THE second day of the 2018 High Council began with the words 'May Jesus Christ Be Praised!' resounding around the chamber. Colonel Arschette Moukoko (Territorial President of Women's Ministries, Mozambique) read from 1 Peter 5 before the Chaplain, Commissioner Mark Tillsley (International Secretary for the Americas and Caribbean Zone), shared thoughts about leadership based on Peter referring to himself as a 'fellow elder'. The devotional period concluded with song 397 from The Song Book of The Salvation Army, the contemporary worship song 'This is My Desire to Honour You'. With that prayer on their lips the council began the day's work. At the end of the first day the Council was working through the Orders of Procedure that will guide the remaining time of the High Council in its deliberations (to appreciate the importance of this see Retired General John Larsson's Inside a High Council chapter 3, which can be downloaded here: sar.my/iahc3). With the orders agreed the council was ready to move forward. The next step in working towards its aim of electing the 21st General of The Salvation Army is to elect a Questions Committee (see Inside a High Council chapter 7: sar.my/iahc7). The members of the committee who will undertake the work of formulating the questions to be answered by each candidate to be General are Commissioner Merle Heatwole (International Headquarters), Commissioner Marie Willermark (Germany, Lithuania and Poland Territory), Commissioner Lorraine Bamford (USA Eastern Territory), Commissioner Clive Adams (Sweden and Latvia Territory), Commissioner Susan McMillan (Canada and Bermuda Territory), Commissioner Oscar Sánchez (Mexico Territory), Commissioner Prema Wilfred (India Northern Territory), Commissioner Grace Chepkurui (Kenya West Territory) and Commissioner Jennifer Walker (Indonesia Territory).